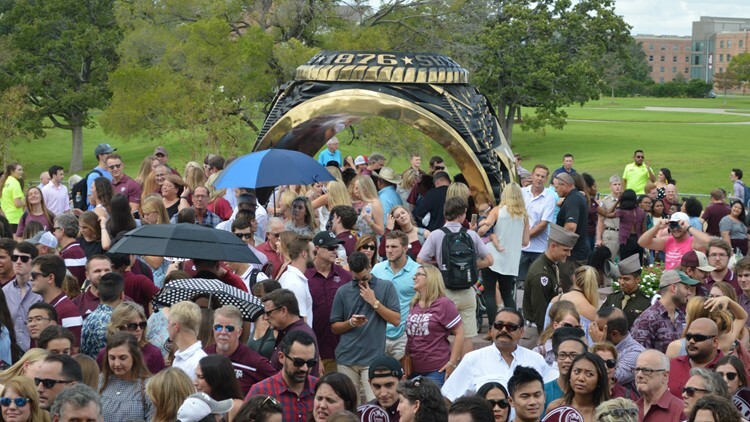 Over the next two days, over 6,000 “Good Ags” will claim their Aggie Rings, often the culmination of years of rigorous academic work. But one A&M student’s Aggie ring story began long before he was a student at Texas A&M University, almost a century ago and half a world away. On Friday afternoon, during an intimate Ring Day presentation at Miramont Country Club in Bryan, Jonas Lossner, A&M Class of 2020, fidgeted in his seat, excited to receive the big, gold ring he intends to don every day. “There are really no words to express how thankful I am for the opportunity to come here, study what I’m passionate about and pave the way for me to give back to the very same people that made me who I am today, the Aggie Family,” Lossner said, addressing his German family along with the network of Aggies whose efforts to recruit Lossner to Texas A&M University precipitated the Ring Day ceremony now before them. “For me, getting this ring is like finishing another chapter of the ring story,” Lossner said later. “The ring story” began in November 1944 near Kommerscheidt, Germany during The Battle of Hurtgen Forest, a series of fierce battles fought between American and German forces during WWII. Turney Leonard, A&M Class of 1942, was seriously wounded during the battle. His left arm was almost severed from his body. His Tank Destroyer Battalion surrendered to German forces who took the unit captive. Leonard was left in a dugout. Despite a subsequent search, Leonard remained missing until 1949, when his remains were discovered by a crew excavating the former command post dugout. Leonard’s ring, which he had worn during the battle, was not recovered with his remains because, in 1946, a then 15-year-old German teen Alfred Hutmacher employed by an American team searching for war dead in the Hurtgen Forest found the Aggie Ring while digging near a suspected burial site. With no idea what the ring signified Hutmacher pocketed the ring, returned home and placed it in a box, where it stayed forgotten and untouched for over fifty years, until his son-in-law Volker Lossner, a German army officer, expressed interest in The Battle of Hurtgen Forest. Recalling the ring he had found half a century ago, Hutmacher produced the ring. Upon inspection, Lossner discovered Leonard’s name engraved in the ring. After some investigative work, Lossner identified Leonard as a former A&M student and Medal of Honor recipient. After contacting Texas A&M, Lossner presented the long lost ring to Douglas Leonard, Turney’s only surviving sibling, during a special ceremony in College Station on November 11, 2000. In turn, Douglas Leonard presented the ring along with his brother’s Medal of Honor to Texas A&M President Dr. Ray Bowen to display permanently at the Corps of Cadets Center. Years later, James Nelson, A&M Class of 1949, offered to help pay for Lossner’s sons, Sebastian and Jonas, to attend Texas A&M. Both sons accepted the offer and in 2016 Sebastian, Lossner’s eldest son, graduated wearing his Aggie Ring, an almost exact replica of Leonard Turney’s save the inscription inside the ring which bears his own name. Now, in April, 2019, Jonas received his A&M Ring and expects to graduate in 2020. Often, Jonas visits the Corp of Cadets Center and sits in front of the case displaying Leonard’s A&M ring and Medal of Honor to remind himself of the sacrifice Leonard was willing to make to liberate Germany. “It’s important to always remember history and to share this story because people see that former enemies can become friends and family,” Jonas Lossner said. Photo caption: Jonas Lossner, A&M class of 2020, poses with his Aggie Ring after an intimate Ring Day presentation at Miramont Country Club.